Today I’m on my way to Philadelphia for a job interview. I’m really looking forward to it. 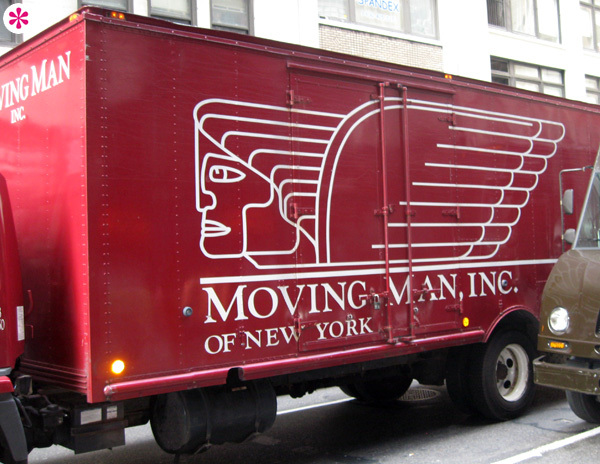 And since thoughts of moving there are on my mind, here are a few sweet looking moving vans for you to enjoy. There’s a certain crudeness to this (it’s hand painted after all), but I love the colors, the holding shape around the name, and the pun on their name in the tag line “Move Auer Way”. The nesting Gs in the logotype are gorgeous. And the idea and execution of the big feet is pitch perfect, especially when you realize the feet get to move around a bit like they do on the Xpress box. The van’s colors are deliciously bizarre and memorable too. I took this photo ages ago. 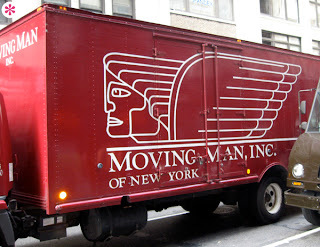 I just love the winged man-head. Simple, clean, and quite handsome. The type needs a little work, but the rest is right on.